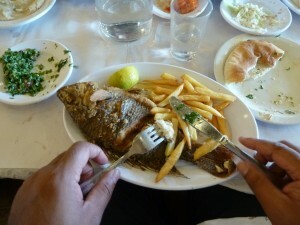 Next we ate St. Peter’s Fish at the Tanureen Restaurant before the drive south UP to Jerusalem. It is always UP to Jerusalem since it is where God dwells and is the highest place on the earth. Along the way I gave my conversion story on the buses, Fr. Ahn gave his vocation story and Teresa Tomeo told her story of her coming back to the Church. We stopped at Ein Kerem to visit the Church of the Visitation where I gave my talk on Mary, Ark of the New Covenant. Then we arrived at the Notre Dame Hotel in Jerusalem which is across the street from the Old City and the Holy Sepulchre. Everyone had a great dinner and went to bed though we did arrive early and had some free time. Tomorrow we spend the whole day in Bethlehem.